Our Leading North Carolina series highlights members of the Research Triangle Foundation’s Board of Directors. Local writer Bridgette A. Lacy is interviewing the entire board to learn about their background and how they view RTP’s future. Each board member has a unique story that effects their perspective on how we should redevelop RTP in order to be better positioned for tomorrow’s workers. We are thankful for their time, their wisdom and their willingness to continue working with our team on this journey. 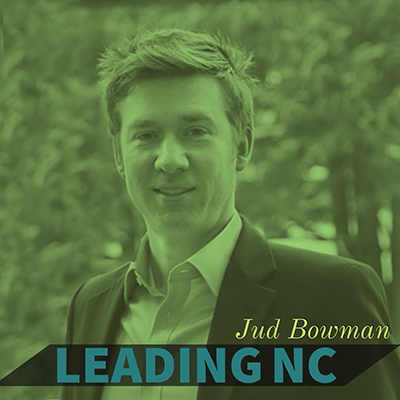 Jud Bowman is a serial entrepreneur. He recently sold his second company, Appia, Inc., the leading mobile user acquisition network, which has delivered more than 100 million mobile app installs globally. In March, Appia was acquired by Digital Turbine in a stock deal worth approximately $100 million. As part of the transaction, Jud agreed to join Digital Turbine’s Board of Directors and also became one of their largest individual shareholders. “I’m an optimist,” says Jud. “By definition as an entrepreneur, we see the potential for what’s possible. Jud has been named one of the world’s “Top 100 Young Innovators” by MIT’s Technology Review and one of “Tech’s Best Young Entrepreneurs” by BusinessWeek. He was also recognized as a winner of the Ernst & Young “Entrepreneur of the Year” award in the Carolinas in 2001 and 2010. The 33-year-old is by far the youngest member of the Research Triangle Foundation Board. The North Carolina School of Science and Mathematics graduate started his first company in 1999 as a high school senior with his classmate Taylor Brockman. Because of that early shared experience, the two created the Bowman-Brockman Endowment for Entrepreneurship & Advanced Research in 2011. They donated $100,000 to support the next generation of creative students. Todd Roberts, the chancellor at the N.C. School of Science and Mathematics, says one of the biggest issues for students was having money to start a company. Jud has been very engaged since graduation, supporting both students and the school. The two Millennials, Jud Bowman and Taylor Brockman, grew up in an era during which mobile phones were taking off and users wanted access to more data. Together they co-founded Pinpoint from their dorm and raised $20 million in venture funding from NEA, Massey Burch Capital, Noro-Moseley Partners, Wakefield Group, and angel investors. After high school graduation, Jud briefly attended Stanford University before taking a now indefinite leave of absence to return to one of his favorite zip codes, 27713, to continue pursuing his entrepreneurial dreams. His first office was on Meridian Parkway right on the edge of Research Triangle Park. Pinpoint merged with PowerByHand in 2004 to form Motricity, Inc. The company provided integrated mobile content solutions for handheld and mobile devices, grew to more than 500 employees, and completed a successful IPO on Nasdaq. “Back then, everyone starting up wanted an RTP address or at least a P.O. box,” he says. “That was important to attract capital. Jud’s second company, Appia, was located in American Tobacco’s central Power Plant Building, the red brick landmark where the Lucky Strike Smoke stack once billowed into the Bull City’s night air. It’s now Digital Turbine’s largest U.S. office. Jud represents the newest generation of innovators. He comes to the board at a time when the Park is re-inventing itself, transitioning from a traditional landlord of big global companies to a more of a mixed-use community. “I think the RTP has a chance to become the place for companies of all sizes, including start-ups,” he says. “You want to have an environment that is very collaborative, that is creative and let’s people think,” he says. “I want to be a part of the board when the first Starbucks in RTP opens,” Jud jokes.